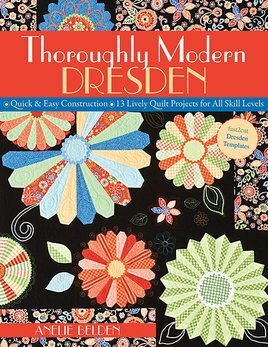 Not Your Grandmother's Dresden Plate Quilts! Forget everything you thought you knew about Dresden Plate quilts. The new Dresdens are colorful, clever, and fun-nothing stodgy or old-fashioned here! They're easy to make, too, with Anelie Belden's new stitch-and-flip technique. Try this fresh take on an old favorite.Not Your Grandmother's Dresden Plate Quilts! Forget everything you thought you knew about Dresden Plate quilts. The new Dresdens are colorful, clever, and fun-nothing stodgy or old-fashioned here! They're easy to make, too, with Anelie Belden's new stitch-and-flip technique. Try this fresh take on an old favorite.